Like all Arengas, Old World. Specifically from Taiwan and surrounding areas. Tolerates frost, probably to the upper teens F.
Narrow, pinnate (feather shaped) leaves with jagged edges at tip; silver color underneath. Variable, typically under 12 feet feet, sometimes only to 8 feet. Compact suckering species with silver back to the leaflets and very fragrant blossoms. 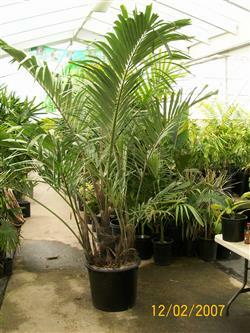 See Cold Hardy Palms Palms For Moderately Severe Cold Weather.